From hesitant toddler to confident kindergartner … the Montessori pre-primary environment is designed to nurture the child over a three-year period, allowing the inner child to blossom and emerge ready to enter the world of elementary school. Specifically, she identified stages she termed as “Planes of Development”which help to define what children need for optimal growth and learning. She observed these consistent characteristics in various stages with children the world over, despite culture, socioeconomic background or family history. They are innate to the human person — part of the natural process of maturation from infancy to adulthood. She concluded the objective of education was to respond to these natural stages of development by creating environments that would nurture the child’s growing self-awareness and understanding. Montessori’s illustration of these Planes of Developmentis in the form of a continuous line with four triangles. Each plane incorporates six years, with the first three years as the time of intense growth and development, followed by three years of integration and transition into the next plane. Children in these three-year cycles are oriented toward similar goals and needs, resulting in the learning environments reflecting this. Learning environments are traditionally setup to serve these three-year cycles. Having all three years in the same environment allows each child to progress through the current plane on his/her own timeline and meet developmental milestones on an individual continuum, moving among peers at all stages of the same developmental plane. It is expected children will remain in the same environment for the entire cycle, completing the full step in Montessori’s Planes of Development. At 3 years old, the child is emerging from toddlerhood and entering a stage of relative stability and calmness. It’s a period of refining fine-motor movements and strengthening gross-motor skills. Activities requiring precise movement are of particular interest as the 3 year old develops hand and finger movements and coordinates them with eye movement. Language begins to explode at this age as the 3 year old begins to form longer sentences and becomes more aware of the power words have as both a communication tool and an instrument of discovery. Cognitively, the 3-year-old child’s ability to reason begins to expand rapidly as he/she continues to sort out his/her world. Sorting, classifying and naming objects are of keen interest. Socially, the 3 year old is slowly emerging from the world of parallel workto more intentional engagement with peers in cooperative work. In the Montessori environment, these developmental needs are met through an emphasis on practical life and sensorial works, which help to develop those precise movements and give the child the tools to continue to discover the world in an engaged manner. Language and math works help the 3 year old refine those areas of naming, categorizing, sorting and classifying. The 4-year-old child is typically quite active both physically and mentally. He/she is usually well coordinated and self-motivated. The 4 year old tends to have boundless energy and is eager for all things new and exciting. As his/her world continues to expand and grow beyond the home and school environments, the 4 year old wants to understand the “why” of the world. He/she loves to name and classify objects as well as “play” with words. It’s not unusual to have a 4 year old create silly words, trying to rhyme and blend together phonetic sounds and phrases. The refined fine-motor skills of the 4 year old allow for an explosion of writing as the child begins to use writing as another instrument of communication to express thoughts. The Montessori environment is rich with language materials to aid the 4 year old with this love of language. The moveable alphabet and the sandpaper letters are excellent tools to help them practice and absorb language as emerging readers and writers. 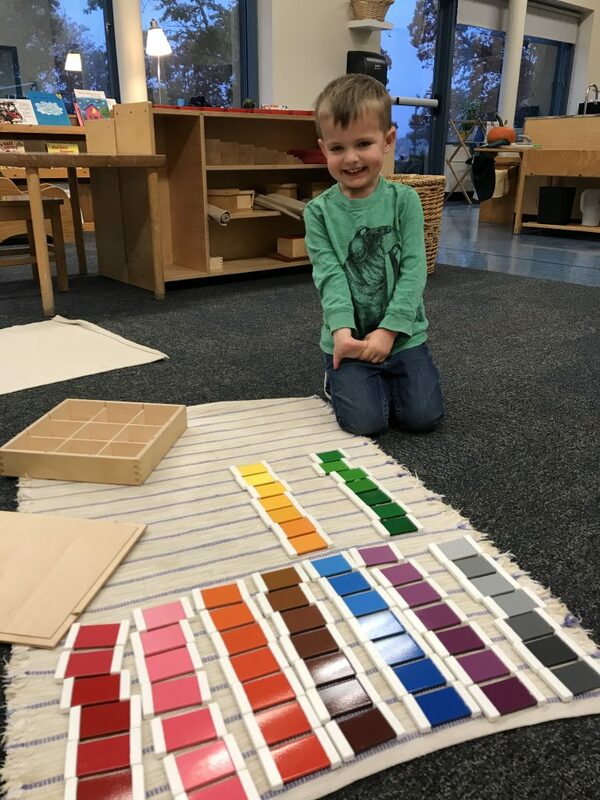 The sensorial materials, so loved at age 3, now expand into the math area, with a concrete progression of the power of numbers and how the decimal system works. The emerging reader can now jump into reading more fluently, decode words with phonetic skills and recognize sight words easily. The 5 year old enjoys showing off his/her reading skills by reading signs, menus, etc., looking for familiar words and phrases. Their counting skills now allow him/her to work with materials that move into the hundreds and thousands, seeing how numbers grow and represent quantities. Socially, the 5 year old is ready for the ever-expanding social network. Friendships emerge and 5 year olds are often found in “roving packs” exploring the environment together. The 5-year-old child is more personally aware of his/her own skills and abilities, seeing how these relate to others. They enjoy a position of leadership in which these social skills can be practiced and honed. The Montessori environment, with its rich math and cultural materials, feeds the 5 year old’s growing hunger for knowledge. The skills that have been developed since age 3 now begin to open up new worlds for the 5 year old, allowing him/her to begin to piece together an understanding of how the world works and see the beauty of the universe. Reading and writing give them the needed skills to express thoughts and understandings as well as become more and more independent in his/her learning. The kindergarten year in a Montessori class is unparalleled in the quality of learning and formation it provides for the 5 year old. The child can bring together much of what has been experienced over the years in the pre-primary environment. The child is given the opportunity to work with materials, introducing concepts well beyond what is taught and presented in a traditional kindergarten setting. The child is not beginning a new school or a new classroom, but rather experiencing what it means to be a leader among others, developing a sense of confidence in him/herself. The experience of this third year gives the child confidence: intellectually, socially and emotionally. It helps to foster the child’s natural curiosity for learning, allowing the child to realize his/her fullest potential in preparation to enter the world of elementary school.